With QuoteWerks, evolve your sales process so you can sell more, faster, and easier. Deliver a customer experience your brand can be proud of and your team will stand behind. Close deals faster. Capture electronic signatures, easily accept orders and collect credit card payments (collect deposits, progress payments, balances). 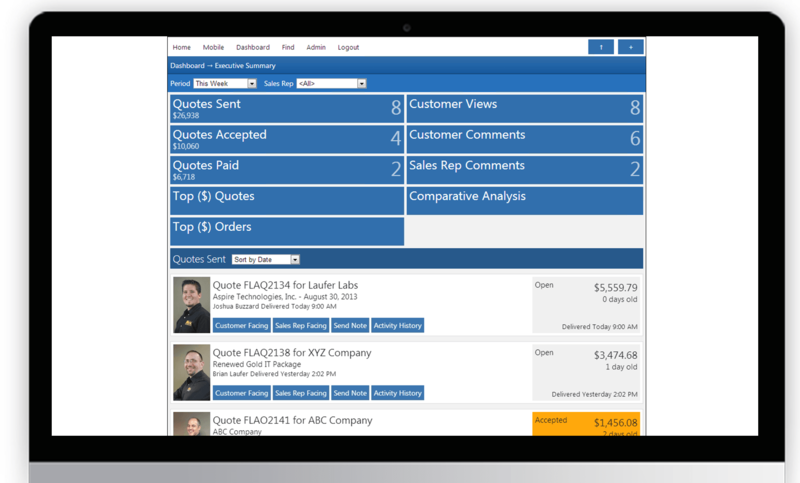 QuoteWerks integrates with your existing CRM and Accounting solutions. QuoteValet is the online quote delivery and acceptance vehicle for QuoteWerks. QuoteValet is a more robust way to deliver quotes to your customers and prospects. Rather than attaching a PDF file to the quote and emailing it to your customer (where spam filters strip it out), QuoteValet will create a personalized web page to present the quote on quotevalet.com. Your customer will be able to change quote options dynamically and ask you questions through the customized quote page — keeping all communication together. Most importantly, they will be able to electronically accept and sign the quote!